In my view, the past week [first week of May, 2010] represents the beginning of the second phase of the economic meltdown. Yes, it is a global crisis, in that most countries will be affected negatively to some extent. But the epicenter of this catastrophe is clearly the United States, which thanks to the abandonment of the Gold Standard in 1971 has fostered and create the conditions which threaten to wipe out countless Western currencies. THE UNITED STATES, VIA THE EVIL PARTNERSHIP BETWEEN WASHINGTON AND WALL STREET (as represented by the Federal Reserve, the supposed “government institution” which runs monetary policy but in actuality is a private corporation owned and operated by Wall Street banks such as Goldman Sachs and J.P. Morgan), has completely and utterly destroyed itself and taken down dozens of other countries as well. Yes, they all willingly abetted the U.S. by adjusting their own fiscal and monetary policies to maximize the (short-term) benefits of the U.S. Treasury printing press, but make no mistake that New York (as well as the “pimple on it’s arse” London) are 100% responsible for the economic calamities we are currently facing, which in my view, sadly, are just commencing the “second inning” of a potentially extra inning ballgame. As you’ve heard me say often in recent months, I have been writing less than usual due to my utter disgust with the greed, corruption, propaganda, and frankly, the pure evil I have been witnessing on a daily basis from the government, banks, and media. It often feels like I am being suffocated by such horrors, not to mention the natural disasters which have been teaming up with the man-made problems to amplify their negative effects. Starting with the numerous devastating earthquakes, such as those in Haiti, Chile, and China, the Icelandic ash cloud which has again surfaced this weekend to shut down European airports (what an ironic tale of revenge), and the devastating oil slick which continues to run rampant in the Gulf of Mexico (this weekend’s attempt to cap it miserably failed), and you almost get the sense that Mother Nature herself is showing her displeasure with how her world is being abused. But enough with the social commentary for now. The main purpose of this article is give my views on what is currently occurring in the U.S. financial markets, particularly the equity and precious metal markets. Since the Dow bottomed in March 2009, it rose nearly 70% in the most obviously rigged fashion I have seen in my entire career. Despite the increasing drumbeat of bad news, including rising unemployment, bankruptcies, and foreclosures, the U.S. government (aided by its “Working Group for Capital Markets”, i.e., the PPT, and its internal “Department of Fudged Statistics”), have been able to engineer a mini stock bull through the creation of trillions of dollars from its printing press and still more trillions of new debts. Add in a few trillion of bailouts (universally rejected by the populace, by the way) to the very same entities entirely responsible for this tragedy (Goldman Sachs, Citigroup, AIG, Fannie Mae/Freddie Mac, General Motors, etc.) and a fortuitous change in the FASB’s accounting rules (enabling banks to value their worthless derivative contracts at whatever they’d like), and voila, a stock market recovery was created, amazingly with the least volatility I have ever seen. And don’t forget that those same evil banks not only fudged their accounting and swindled their investors to produce fake earnings which they promptly paid back to their executives as bonuses (as well as to Washington via lobbyists), but they also gamed the system via new fraudulent trading systems which have completely taken over the stock market. Which brings me to what has happened in the financial markets last week. After the aforementioned 14 months of stock market bliss, accompanied by the blaring trumpets of the Washington/Wall Street/media propaganda machine that the economy has dramatically recovered, darkness re-emerged over New York, London, and the world’s major financial centers. Sadly, Newsweek (which ironically is on the brink of bankruptcy) appears likely to win the most pathetic market call award, leading its April 19th issue with a story titled “America’s Back – The Remarkable Tale of our Economic Recovery”, right at the top of the market. This Newsweek article will likely turn out to be as prescient as Business Week’s August 1979 article titled “the death of equities”, written only days before the Dow commenced a 30-year explosion from 800 to 14,000. One never knows where the next news flashpoint will be, and if you told me last year that the global economy’s fate would be focused on poor little Greece, I would have laughed. But indeed that tiny country’s economic calamity has (erroneously) been the focus of global financial markets for some time now. Greece’s financial situation is no different than dozens of other Western nations, including the U.S. which frankly is in far worse shape, but because Greece doesn’t have the ability to print its own currency (as a minor player in the European Economic Community), it must rely upon others to pay off its debts, or else default on its obligations. In other words, in a gold standard-less world where nearly all Western countries are technically bankrupt, it is the weakest nations that are going under first, starting with the weakest of all, Iceland last year. But now the cancer is starting to spread to more “vital organs” than Iceland, and once again it looks like the Washington/Wall Street/media propaganda that the contagion was “contained” will turn out to be completely wrong, just as when it claimed that the mortgage crisis was contained in the subprime market. Greece is now officially dead financially, and this weekend was forced to accept a massive bailout from the U.S. (via the IMF, which it controls) and the European Central Bank (ECB), another entity with the ability to print its money out of thin air which is essentially controlled by Germany. In return, Greece will accept massive austerity measures that will (rightfully) send the nation’s standard of living back a few decades, which is why all the rioting is currently occurring in Athens. And the part that doesn’t get reported, of course, is that none of that bailout money (I believe around $120 billion, not even 15% of the TARP funds used to bailout out Wall Street) will be used to help Greece, but instead to pay back conniving, thieving European Banks that loaned money to Greece, often on terms that purposefully hamstrung them with the goal of eventually bankrupting them and taking over their assets, as they did today. In fact, in Greece’s case, none other than Goldman Sachs is the most responsible entity for the nation’s collapse, as it secretly fleeced the nation’s leaders by selling them derivative instruments that enabled Greece to hide its true financial condition from the world, thus enabling it to increase those debts to the point of bankruptcy, which is where it stands today. “Worries about Greece” have been the lead propaganda story for the past month to explain why the Dow had stopped rising, when in fact dozens of nations have been simultaneously lining up to march off the financial cliff for some time now. Greece is the first, but much larger nations are next, starting with Spain, Portugal, Ireland, and Italy. Japan, Germany, France, and other high profile names will be next, and finally the U.K. and the United States will represent the denouement of the failed “dollar standard” created after World War II after the rest of the world had nearly destroyed itself. Just like the Watergate scandal, which started with the prosecution of lower level White House staffers and finally reached Nixon’s office, the sovereign debt cancer will work its way through the global monetary system until it reaches its “brain”, the United States. And you can take that to the bank. Contrary to what you’ll see in the media, these comprehensive worries are what started the ball of negativity rolling this past week, not the inconsequential problems in little ol’ Greece. And unlike the U.S., in which the 50 states have a somewhat homogenous culture (and no separate Central Banks), the Euro currency is comprised of 16 different countries with their own cultures and financial policies. Thus, the Euro will likely collapse before the U.S., which is why the dollar has been rising so sharply against it in recent months. Of course, the fact that one piece of fiat (unbacked) garbage is rising against another piece of fiat garbage is hardly a victory, and as long-time “goldbugs” such as myself have long maintained, the real value of fiat currencies such as the dollar and Euro should be measured against real, historical money, i.e. gold and silver. And boy are they doing so lately, as you’ll see below. The downward illegal manipulation of gold and silver by Western Central Banks for the past 15 years (led by the U.S., of course) sent a false sense of security to financial markets that “inflation is under control”, which it most certainly is not. 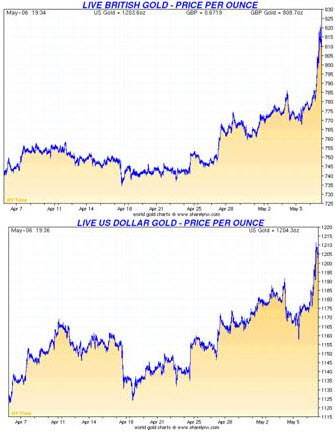 But now that this rigging is in its final stages, and the aforementioned issues are starting to take control of the market mindset, gold and silver are hitting new all-time highs in nearly every global currency on a daily basis (see below). Pretty soon the “Greek crisis” will be better understood to be a just a tiny part of the “global fiat currency crisis”, at which point the demand for gold and silver will soar so high that people will laugh hysterically when they think about the piddly gains made by dot com stocks in the late 1990s. Now, about that 1,000 point drop in the Dow on Thursday. I have been watching the stock market daily for more than 20 years, and never have I seen a spectacle like what occurred on Thursday. Any lingering thoughts that the U.S. stock market has any remaining semblance of a capitalistic pricing mechanism should be gone forever, not withstanding the desperate propaganda efforts that will be exercised to convince investors otherwise. I have long known that the U.S. government “plunge protection team” (aka the PPT) has controlled the market’s movements for nearly a decade (with few exceptions), but now when you combine the detrimental effects of the PPT with the fraudulent trading programs created by Goldman Sachs and the other Cartel dons) it should be quite clear that the markets here are completely rigged, as well as more dangerous than a blood-filled pool of hungry Great White sharks. “Program Trading” is the harmless-sounding term that describes stock market trades that are automated. When the stock market crashed in 1987, program trading had an even more innocuous sounding name, “portfolio insurance”, but its modus operandi was the same. In other words, pre-determined computer programs are created by Goldman Sachs and the like (such as the U.S. government, via its countless hidden offshore entities) to make trades at pre-determined prices based on the triggering of alternative market scenarios. These “algorithms” are no different than the “coding” of a robot’s brain, such as Terminator brains (like Arnold Schwarzeneggars’) were by SKYNET. Just as the Terminator was programmed with only one objective, to kill John Connor, these algorithmic programs are told to mercilessly and thoughtlessly execute stop limit orders, in other words to buy or sell in massive quantities when certain market prices are hit. I won’t even discuss the illegal world of “High Frequency Trading” in this missive, which essentially means the Terminator brains are set up in the same room as the NYSE computers so they get the additional advantage of being able to “front run” orders from poor saps like us who enter our order in “less privileged” trading systems such as Charles Schwab, E-Trade, and basically any firm that is not the proprietary trading desk of Goldman Sachs (by far, the largest program trader in the world), JP Morgan, or other members of the Washington/Wall Street banking Cartel. As an aside, by the way, how ironic is it that Arnold Schwarzenegger [previously employed as the Terminator] is now the overweight governor of California, possibly the most financially crippled municipality on the planet? Greece may be the flashpoint blamed for the 1,000 point market decline last week, particularly Thursday’s debacle, in which the Dow was down 1,000 points intraday before winding up down 350 points. But the real issue is the aforementioned GLOBAL SOVEREIGN DEBT CRISIS, accelerated by the proliferation of “SKYNET stock trading” that caused a feeding frenzy of computer-generated selling which nearly took the entire system down in a 20-minute period. In fact, the selling programs got so out of control at one point that even market icons such as Proctor and Gamble got sucked into oblivion. As shown by the below bar chart, PG fell from $62/share to $38/share in minutes, causing billions of dollars of investor losses thanks to the computers. Oh yeah, after the PPT likely stabilized the market (at exactly minus 1,000 points), PG ran back up to $61 in less than an hour, accentuating the criminality that caused those billions of investor losses. And speaking of “accentuating”, the stock of IT-consultant Accenture, a $25 billion market cap, fell from $40 to nearly zero during the carnage, but happily for those that were not sold out by the SKYNET computers, is back to $40 again today. Make no mistake, the combination of government intervention (to foster the fake perception that all’s well) and the proliferation of computer-based trading programs that now account for more than half of all NYSE trading (and don’t forget the OTC derivative contracts that accompany them) are the real cause of this week’s market debacle. Consequently, what we saw on Thursday was likely just a “warning shot” of what’s to come rather than an aberration as the Wall Street/Washingon/media propaganda machine will try to convince you of. Can you believe they actually circulated a rumor that the decline was caused by a “fat-fingered trader” that accidentally typed in “B” for billion instead of “M” for million? Yep, that’s 2010 America for you, the land of the free and the home of the brave. Oh, by the way, did anyone notice what Precious Metal prices did this week? 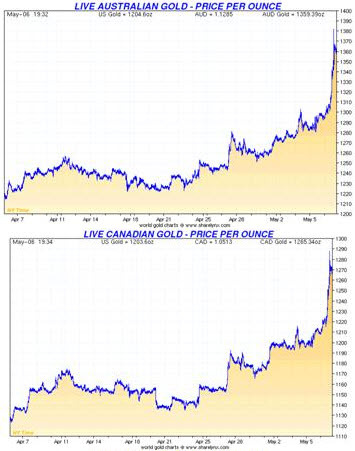 Did the $35 gold price gain on Thursday open your eyes to what the world is thinking about these days? Or how about silver’s stunning $0.90 surge on Friday? 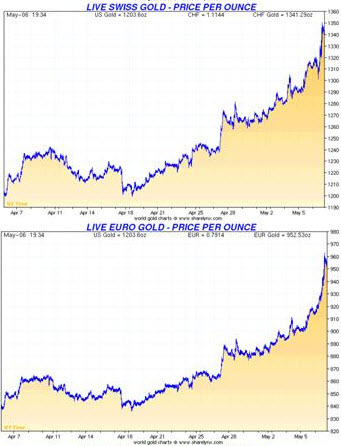 Or, per the below charts, the fact that gold is now at an all-time high in nearly every global currency, and in some cases has started to turn parabolic, as in the case of gold price in Euros, British Pounds, and even Swiss Francs, supposedly the world’s most stable currency. I’ve got a secret for you y’all; the Swiss Franc is no safer than the U.S. dollar, except for the fact that Switzerland is less likely to join financially-draining wars due to its neutrality. To conclude, I believe that what happened last week was just a “shot across the bow” of financial systems, particularly Western nations and most particularly the listing U.S. empire. Greece is just the tip of the iceberg, and in my view it won’t be long before bigger fish such as Japan, the U.K., and the U.S. are in the market’s crosshairs (by the way, the U.S. employment report was a complete and utter sham – can you say “birth-death model” and “census takers”?). Actually, I am still not sure if the stock market will “melt-up” due to surging inflation (stock prices in that scenario would not keep up with an exploding cost of living) or if it will “melt-down” as it did on Thursday. But one thing I am sure of is that Newsweek’s “America’s Back” article will prove as ill-timed as Business Week’s “Death of Equities” article in 1979, and that the prices of gold, silver, and other items of real value will soar to levels not imaginable by the even the most ardent bulls (such as myself) in the coming years as the world shuns the fraudulent fiat currency system currently centered at “Ground Zero”, the evil coalition between New York, Washington, and London. 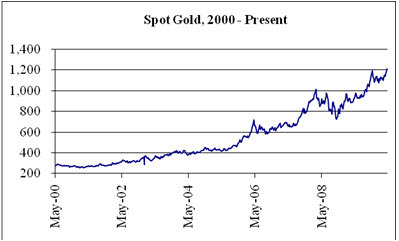 And by the way, does anyone find it ironic that the British election that likely will end the disastrous reign of Gordon Brown as Prime Minister occurred on Thursday (Brown famously sold nearly all of England’s gold at the market bottom in 2000), the very day in which global re-recognition of gold as the pre-eminent reserve currency, was simultaneously taking hold? P.S. It looks like the New York Post wrote an article about the this week’s (largely ignored) news that the U.S. Justice Department is now officially investigating JP Morgan for its long-standing downward manipulation of the silver market (http://www.nypost.com/p/news/business/feds_ probing_jpmorgan_trades_in_gZzMvWBqOJpB55M7Rh9vwM). Wait till you see what silver does when the racket is blown up. Think it can’t trade at a HIGHER PRICE THAN GOLD?